Young’s Bus Service would like to share the current (November 3, 2014) qconnect Bus Fares and Concessions Policy to assist Queensland students (and their parents) travelling on Young’s Bus Service during the school holidays. Chapter 5: Concession and Discount Fares. A 50% concession fare applies to primary and secondary school students attending a Queensland school. Primary school students must be wearing a Queensland school uniform, otherwise they are considered as Children. Secondary school students must have a valid student ID card or be wearing a Queensland school uniform. A person enrolled at a Queensland primary or secondary school, or a person enrolled in the Get Set for Work program. Students who are unable to display their student card and therefore unable to prove they are a student will be charged the full adult fare. Young’s Bus service abides by the regulations of the Department of Transport and Main Roads and QConnect. The qconnect Bus Fares and Concessions Policy can be viewed here. 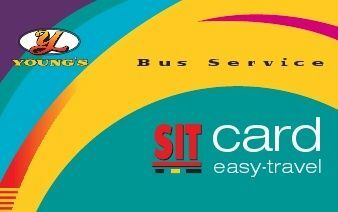 By adding credit to your SIT Card with the bus driver it becomes an Easy Travel Card, saving you 20% off your school holiday travels.